Am I right? Most of us have made a Yellow Brick Road quilt. It is a great, time honored quilt pattern. I have taught many a person to piece using this pattern. Well, I just found Terry Ann's blog! I saw a link at Mary's blog to a tutorial on TA's blog for a graph paper binder cover. It is just the cutest thing ever. So just like Mary, if you have a spare minute and need something to do feel free to make one and send it to me! I am going to see if she will make one for the bigger pads of graph paper too!! OK, I was blog hoping and found this over at Chooky blue's Blog. You can publish your blog as a book! It's at Blog2print . How cool is that? I am going to look into that so my kids will have it as a record. You can do soft or hard cover and it will work from Blogger or Typepad. Currently it takes 350 photos. As I was working on my "neighborhood" quilt with all the free form houses it occurred to me that I could probably draw out my houses and make patterns that you all could use if you wanted to make houses too. You can certainly do it like I did but what do you think about me posting a pattern (or 2) every month? Is anyone interested in these as patterns?? Let me know as soon as you can so I can make a decision about making a pattern. Have a great weekend everyone. We re expecting more snow this weekend! BRRRRR!!!! Let me know if any of you try it and what you think. Now for the websites! It was only a matter of time before someone came up with this. It's a "bakery" using the Moda "ingredients". There are lots of free patterns using the Moda pre cut baked goods. Go and see what you think! And lastly try this site for great sale pricing. Check out their sale part. They usually don't have a lot of the yardge but the price is usually HALF what you usually pay!! So that's it for now. Go and check out those websites. Well, her is my friend Karen and the banana chocolate chip cake. It looks like a church with snow on the roof. HAHA, This is the tree fabric I forgot to declare the first time I did my stash report. So cute! Thanks, Ruth-Ann!! I went over to my friend, Charlotte's house to help her with a border for one of her quilts and decided that since I was going I would bring my "House" quilt and make use of her design wall. Here are all the little houses with the house fabric blocks inbetween. What do you think of the big polka dot border? I am still playing with borders. I will get the blocks sewn and then have to make some choices. 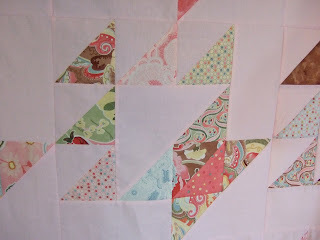 Last night I went to sleep thinking about this quilt and now I have some more border ideas that I will try. Woke up this am to *more* snow. It was all sparkly and pretty. I don't know if it shows up very well in this picture but it was so very beautiful. Just a light dusting of fluffy stuff. Today is my friend Karen's 32nd birthday. I made a banana chocolate chip cake, very yummy! I love this recipe it is easy and always good. I used a church bundt cake pan and put powdered sugar on top so it looks like snow on the roof. She is from Brazil and so snow is still a novelty for her, lol. I will take a picture and post it either later or tomorrow so you can see too. It smells like heaven. I shouldn't eat any with this diet,but I will probably take a little piece. I'll have to point it out later, *sigh*. Good news is the scale told me that I have lost what I had gained and a little more too, so that's good news!! I just got Kara's quilt back from LTW and she sent me these photos of her dog, Buster. He was "helping" her quilt Kara's quilt. "Hey what's under here? It sure *smells* like cats! They just gotta be here somewhere!" Now you get the see the beautiful quilting LTW did on this quilt. She used the same quilt pattern on this one that she used on TUQ (The Ugly Quilt), and I just love this pattern. The back is a very pale green flannel and I hope Kara will like it. Here is the front, quilted. I'm going to get the business "stuff" over first. Stash report is no fabric in and no additional fabric out. Thanks, Ruth-Ann, I totally forgot about the fabulous green tree fabric you gave me, so sorry. Now I will amend it to 1 yard in and no fabric out. Weight loss not such a great week, but whatever. I'm back on track. I gained 1.6 pounds so now my weight loss total is only 3.8 pounds. I thought you might like to see the baby star quilt. I finished the binding this weekend so now it is completely finished. I can't label it until the baby is born in July. 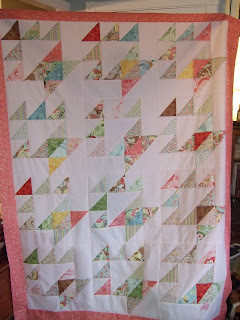 Didn't LTW do a great job with the quilting? As usual. I love the shooting stars! Here is what I used for the back. My niece loves cats and this is flannel. So soft. I did manage to get this block 7 of the Designer Mystery BOM done this weekend also. The biggest accomplishment was that I managed to get all my house blocks sewn around this weekend too. It took quite a bit of time to do that for 24 houses and I will get some photos this week for you. I have a stripe for the inner border and I am thinking of using the BIG pink polka dot for the outside border. 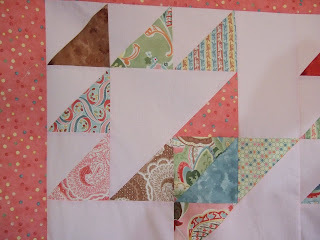 LTW tells me that she has the Paisley Party quilt finished for me to bind so I will work on that this week too. I am planning on laying the house quilt out on Tues or Wed where I have room and finishing that top this week. I may even get to Kelsey's "S" quilt this week. Those are the 2 I am going to concentrate on this week. How is your week shaping up?? I just read about this on the Mrs. Goodneedle's blog. It is a letter that the Bush twins wrote to president Obama's daughters. Take a minute and go and listen to it. Take your tissues!! He did a good job with those girls for them to have written something so touching. Also check out my new button on my side bar!! You can snag it and put it on your blog and send your friends my way!! Mrs. Goodneedle's DIL made it for me!! Thanks Leigh Anna!! She did a great job. Go visit her and Mrs. Goodneedle! Go, do it now!! I was online with a friend's son this am (they live in Australia) and he sent me a photo of this rabbit. I have never seen a rabbit this large before. It is real, not photo shopped. It is a German giant and his name is Herman. Just thought I'd share some of my weird morning! I showed you the cute little houses now these are the blocks that will be between them. This house fabric was the fabric I pulled in the 5 yard challenge. It was the inspiration for the little houses. Cute, eh? I worked very hard this weekend to finish these two tops. This is the Paisley Party top. the colors remind me a little of The Ugly Quilt except that I really love these and the other ones were poor imitations. I think this one will be going to DD2's friend Kara. She is the last of the friends that still *needs* a quilt and I think I can part with this. I really do love it though. I have been working on this top for the last year, literally! It was part of Leanne's 365 Day Challenge. You had to put the rows together (lenghtwise) and write on a square every day for 1 year. I began this last January. I'm glad I did it but I'm equally glad it is over. It would be fun to do a smaller version for someone expecting a baby, if they remembered to write on it! My DD2 told me I needed to make 2 more so each of my children could have a year of my life! My DD1 said there will be no fighting over it as it is hers. Well sorry, honey, I think DD2 will fight you for it! Maybe they can share it, LOL. Who knew?! I was trying to decide what to back it with. Decisions, decisions. I wanted to use from my stash so when I was looking through the flannel bin I found the purrrfect piece. It is white and has cats and quilt blocks all over it and I had enough to use for the back!! I can't show that to you as it is with LTW. I thought I would lead off with a photo of Jack and part of the poem DD1 made up about him and segway into my own diet, clever,eh? I am weighing myself on Fridays. I know it is not what Sharon told us to do but I'm doing it anyway. She doesn't live in MI,** giggle**. I was down by 3.8 pounds this week for a total of 5.4 pounds for 2 weeks! YEAH me! I am finding it difficult to do all the pre-planning I need to do so I can make this lifestyle change. It takes a lot more effort to eat correctly! I did just as well with the stash this last week also. I was a little worried as I bought some stuff but I used way more. I also cleaned out some flannel that I didn't want any longer so it is out of my stash too. Does this count? I tend to think not as I am not using it. I am giving it to someone else to use. Why don't you"weigh in" (pun intended) and let me know what you think about that, ok? I hope you all had a good week too! My weekend was planned, I was going to finish my 365 challenge quilt and the Paisley Party quilt right? Or so I thought. My creative brain had other ideas. I chose a house fabric when it was my turn to choose a fabric for the 5 yard challenge quilt with the CL's, remember? (I need to get a photo of it) The fabric is baby blue with pink, green, blue and purple houses on it. I went to JAF and bought a few fabrics to go with and figured I would pull from my stash. Then it hit me. Instead of making the focus fabric and a pieced block I would make the focus fabric and appliqued houses for the other block! Brilliant! So I spent all day (and I mean all day) fusing fabric and cutting out houses. I did 6 in each color, blue, pink, green and purple. Here is my helper helping me with the purple ones. And you all wonder why I have cat hair all over everything? I no sooner laid these down and Autumn raced in to roll all over them! This is the aftermath of the creative process, LOL! These were inspired by Jacquie at Tallgrass Prairie Studio. So without further fanfare (they all still need to be stitched around) here are my free form houses. These are the purple ones. What do you think? I love them and can't wait to begin stitching them down! I came home from work yesterday and this was what was greeting me! (Of course you can't see the other 3 and the dog but they are all there too!) Hallie is sitting on my cutting mat and Autumn is on the piano. Aren't they so cute? I really wanted to watch Grisom's last show on CSI so I was kind of a slug. I began the TV-a-thon at 8pm and finished around 10pm. I did manage to get my block 6 finished for the Designer Mystery BOM though. I really liked this block. It is so beautiful when it is done and it was not too difficult to do. I am trying to decide whether I want to participate in The Fat Quarter Shop's 2009 Designer Mystery BOM. Are any of you doing it? It is all stars? It is -8 degrees F and with wind chill it is -27 degrees F so it is VERY, VERY cold today! Although not as cold as this! This was taken in 1911 and it is a very frozen Niagara Falls! I wanted to give you a close up of the baby basket quilt with the final border on it. I could have done it from far away but I wanted you to be able to see the fabric. I like how it turned out. You will probably have to see it again when in gets quilted too. Ruth-Ann was the first one to choose. She ended up with the fabric I brought, but she did not get to keep it! Grace stole it from her. Tuesday night was the night we were going to do our 1 yard focus fabric swap with the church ladies for the 5 yard challenge quilt. Here you see the bags lined up containing the 1 yard pieces. You also see Pilar trying to decide whether to take Janet's piece or choose from the fabric in the bag. You see that was the choice. I had the CL's all draw numbers. Number one choose from the bags and opened her choice. Number 2 could either choose from the bagged fabric or take from number 1 and so on. I had just "stolen" from Shirley who now had to choose a new fabric from the bags. Here is Shirley holding the fabric I really wanted. I stole it from her but because I had 2 draws (one for LTW) and Shirley had the last number she stole it back. Darn it! I really loved this fabric! Now Dolores could not decide what she wanted to do either. It was a lot of fun and there really were no bad choices. I got a blue fabric with little houses on it. I probably won't keep it but it will be a nice donation quilt! With this BEAUTIFUL book all about Wales!!! I just love it. She also put sticky notes through out the book telling me things like where she likes to visit and where she lives and aren't you jealous, isn't this beautiful and this is not far from me, etc. You probably all already know that this is one of the places I really *need* to visit before I am no longer on this Earth. *sigh* someday I will do it. As I was drooling, looking through the book Jack was laying next to me and the timer went off on the oven for dinner. I got up to take dinner out of the oven and when I came back guess who thought he should plan a trip to Wales? We got snowed in this weekend. I met my friend Yuki on Friday after work and we had a great time. It was just beginning to snow. This is what my deck looked like on Sunday. It just snowed and snowed from Friday night until Sunday morning! Brrrrrrr!!! I did manage to get the border on my baby basket quilt. I need to take a photo of it though. I had cut out this quilt a long time ago (maybe 5 years or so) when I made one just like it for a gift. I had it on my "to do" list so I hauled it out and worked all day and night on Sat and some of Sunday to get it finished! I am quite happy that I managed to get it finished and I even used a back from my stash! LTW turned me on to audible books that I can load on to my new iPod. I decided to try it out so I could "read" and quilt at the same time. This was amazing!!! I LOVE IT!! The only problem is that the ear buds made my ears ache a little. Well worth it!! My niece is having a baby and I needed a baby quilt for her baby and I don't know the gender so this will be the one. It's nice to have 2 baby quilts going to the quilter already. In addition, I am using 6 yards of fleece to make a fleece blanket. I had it left over from something I wanted to do that didn't work out and thought it would be a good way to use it up too. It is plain green and plain white so I cut out the big block "S"of either color and appliqued it to the opposite color side. I will cut and tie it on Wed when we have quilting at the CHV. Does this get to count in the stash reduction? It is not a quilt but it did take up space in the basement where I store the fabric. Someone needs to let me know. I also sewed all the 4 patch units for the Paisley Party quilt. I will take it and lay it out on Wed also. I probably won't get to sew it but that's ok, maybe on Thursday. Tomorrow the CL's meet and we are all bringing our one yard pieces of fabric for the 5 yard challenge quilt. Funny, the CHV morning group is going to do it too, not with us but at the same time. I'm glad to see they are interested it this too. We are going to have our fabrics in individual paper bags and every person will get a number. Number one chooses from the bags first and opens her bag. Person number 2 can either take from #1 or from the bags that are left and so on. It should be a fun night. I'll try to remember to take some photos to share with you all. I decided to give Amy her quilt last night. Here is a photo of her with the quilt. She was just THRILLED!! She could not have been any happier with the quilt. It was nice to know that she loved it so much. I am anxious to hear what her mom had to say about it too. We are supposed to have a HUGE snow storm tonight, 5-7 inches. For our area that's a lot. I am supposed to meet my friend, Yuki, after work tonight so I hope it starts later than that! I was blog reading and found a place that walks you through how to add a third column to your blog (See below in red) I mean it is EA..SY!! I did it and things turned out just fine. All you need to know is what template you are using. I wasn't even sure about that so I looked under "change template" and found out that I use Minima, layout (whatever that means). So if I can do it you can to. What are you waiting for, go and try it out!! Now can anyone tell me how to strike out a word?? So since you were all so helpful with how to cross out a work in the main part of the blog, I decided I needed to learn how to do it in the sidebar so Patti cam to my rescue. I tried to make my link work above adding the third column but it won't work so if you visit Patti she explains that as well as how to be able to strike out a word in your side bar. Thanks, Patti!! Many more folks will now be able to do this!! 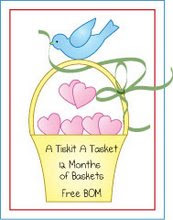 I have found that Ann at Bunny Hill Designs is putting up a free pattern every month of different baskets to thank people for buying her designs and fabrics. She is really a sweetheart and her patterns are adorable. Hop on over there and get her latest design! I bought the tree fabric and it arrived so I had to count that. I ordered the companion fabrics for the cat panel wall hanging so that arrived too. The border fabric for the baby basket quilt was ordered but did not arrive so that will go into next weeks total. All the fabric used was for the baby basket quilt. That makes me feel really good about myself so far this year! Now many of you are looking to lose weight in this upcoming year and Sharon at Red Geranium Cottage has issued a challenge to help us do just that. I have been following but have not officially joined up, still thinking about it. I will probably be a closet joiner! I could stand to lose about 70 pounds (yes, that's right you heard me correctly, 70!) Hmmm, maybe I should be out of the closet at that, LOL! If you see the diet logo appear on my side bar you will know that I have joined. Also you will see my glorious before photos and have to hear about it but hey, if you love me you will want me to be healthier. Maybe if I know you are all supporting me it will be easier huh? Do you think you can help a sista out with that kind of support? I kept after it and I eventually go all 12 blocks made by midnight last night. I put it together this afternoon and even managed to put the first border on it. I wanted to put all the borders on but am a little short with the fabric I want to use for the outside one. I wanted the Mocha POSH paisley but I only have the green. The baby 's room is in brown and pink so I just ordered some. I really wanted to be able to give it to LTW but that is not going to happen. Next up is the paisley one followed by an old baby star quilt that I began a long time ago. I made one when I first learned how to do this and cut a second one at the same time. I have a baby in mind for the newest actually the old, baby star too. I have to make 3 baby quilts so that would be 2 done when I get the star one finished! Pictures of that soon too. I have to go back to work tomorrow and I have been off since before Christmas so I am not looking forward to that, but you do what you have to to keep in fabric, right? Let me know what you think of the baskets! This is the first time I have made a basket quilt.